For the uninitiated, the L90 is the longest commuter bus route in Sydney, winding its way more than 40 kilometres from the CBD up through the northern beaches. With no train lines in the area, the service is something of a lifeline for the carless of the northern suburbs and, for anyone wanting to travel to Modus Operandi, it’s also the most viable option for getting to and from the Mona Vale brewery. So when the brewing team put their heads together for ideas for their first entry to the GABS festival, they chose to name it after the legendary route. They also ended up brewing a beer big enough that, once consumed, would banish any thoughts of driving and instead have you heading for the nearest bus stop. L90 the beer is an Imperial IPA which has been boosted with the addition of fresh mangoes and pineapple. 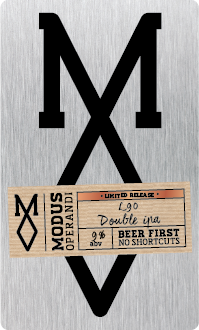 As is the case with Modus Operandi’s other flagship IPAs, this one is of the American style and is suitably loaded with hops. What the fresh fruit does is accentuate some of the natural characters of the hops while adding plenty of their own, particularly the pineapple which really brings a feeling of freshness to the fore. When brewery owner Grant Wearin explained the beer, he made it clear that there was no point in doing such a big and expensive brew – in this case a healthy nine percent ABV – unless it was well balanced and you could actually enjoy drinking it.